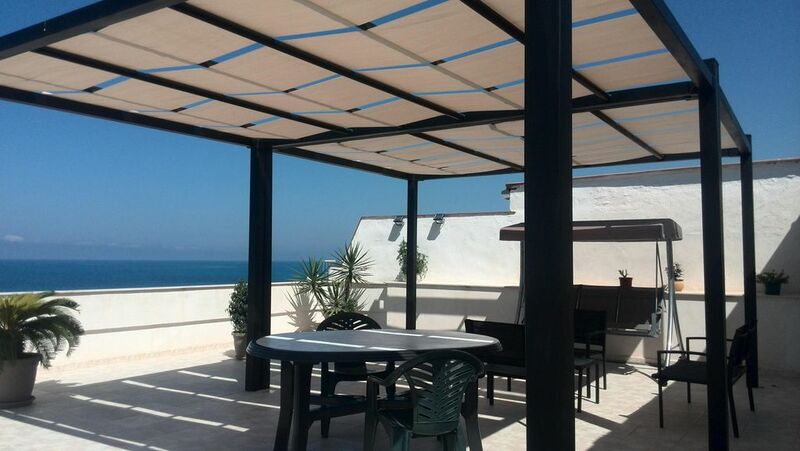 The newly built apartment, well furnished and equipped with everything), thanks to the large terrace enjoyable, offers the opportunity to sunbathe and eat outside enjoying a great view of the sea! The apartment with terrace overlooking the sea, private entrance with many comforts. The apartment was clean, new and neat! It had a great balcony overlooking the ocean, off street parking, and comfy bedrooms. I would recommend this rental! Spotlessly clean home with a beautiful view of the sea. The terrace is a great place for breakfast and evening cocktail hour. The owners were very accommodating and helped us enjoy our stay by recommending a great restaurant and checking up on us after a few days. Would recommend this place for a great seaside vacation. L' appartement est très propre. La terrasse est extrêmement agréable. Nous sommes arrivés vers 22h dans la location et Fiorenza nous attendait. Il a été facile de communiquer avec elle par SMS. Par contre Fiorenza parle seulement italien. 2 des 3 chambres ont des ouvertures donnant sur l'extérieur avec des volets roulants mais sans fenêtres ! Abbiamo passato 4 giorni in questo bel appartamento, la proprietaria molto gentile. L' appartamento era dotato di tovaglie, lenzuola, asciugamani, macchinetta caffè, lavatrice e tutto ben curato e in ordine. La zona è tranquilla come pure la spiaggia fatta di sassi. Mare pulito ma profondo dopo pochi metri. ( in paese a circa 500m c'è una spiaggia con bar e a 1km con sabbia) soggiorno molto gradevole. Strepitoso soggiorno!!! Abitazione pulitissima, estremamente accogliente, comoda e funzionale. Padroni di casa gentilissimi e discreti. Tutto perfetto. Nearby are bars, restaurants, pizzerias, butchers, bakeries, supermarket and pharmacy, some of these are within easy walking distance. A dozen meters in front of the accommodation, there is a beautiful beach is easily accessible. A few miles away are accessible tourist destinations such as the picnic area "Mouth of the River Platani" and areas of archaeological and landscape as Eraclea Minoa, Agrigento, Sciacca and Caltabellotta.